The third of four days at the Caribbean Islands Swimming Championships (CISCs) was highlighted by an outstanding 100 free showdown, with Dylan Carter and Renzo Tjon A Joe both hitting FINA “B” cuts. Joanna Evans, Dylan Carter (pictured above), and Timothy Wynter all swam FINA ‘B’ Olympic qualifying times last night at the Caribbean Islands Swimming Championships. In April of 2015, Bermuda’s Roy-Allan Burch was left wheelchair-bound after a dryland injury shattered both of his knees. Yesterday, he scored a FINA Olympic ‘B’ cut at the Caribbean Islands Swimming Championships. Roy-Allan Burch continued his career comeback, bettering the FINA “B” cut he hit a few days ago. Burch was one of 9 to hit B cuts on the final day of the Caribbean Island Swimming Championships. In fact, Burch was one of five men to hit the FINA cut in the 50 free, but what makes his story intriguing is that just a year ago, he was in a wheelchair after rupturing patellas in both knees during a dryland workout. 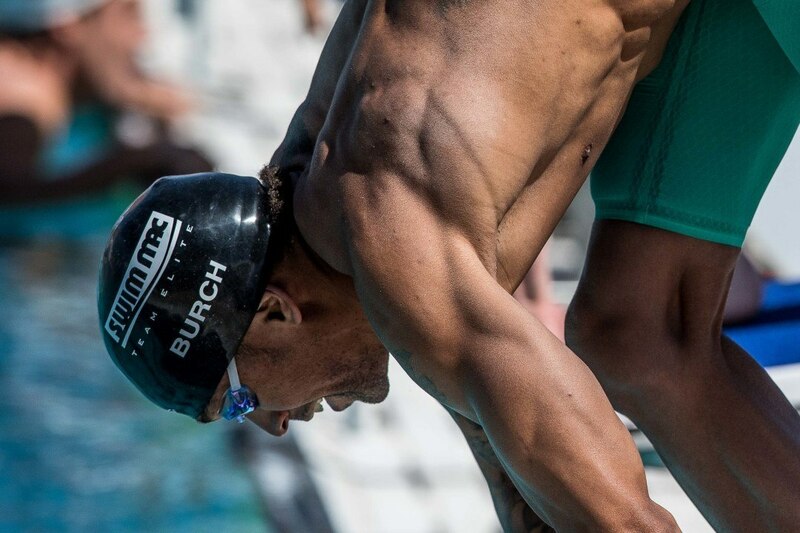 Last Wednesday, Burch completed his comeback with an Olympic-qualifying 22.95 in the 50 free leading off the Bermudan 200 free relay. Saturday, he one-upped that, going 22.79 to take 3rd in the individual 50 free. The win went to Suriname’s Renzo Tjon A Joe, who was 22.54. That comes after his big swim in the 100 free a day earlier. Also under FINA’s B cut: Jamaica’s Justin Plaschka (22.77), Burch (22.79), 100 free champ Dylan Carter (22.88) and Carlyle Blondell (23.02). Carter and Blondell compete for Trinidad & Tobago. In the women’s 50 free, Trinidad & Tobago’s Cherelle Thompson picked up the win with a B cut of 25.90. Also under the Olympic qualifying standard was Aruba’s Ally Ponson at 26.04. There were two more B cuts to cap the meet. Dustin Tynes of the Bahamas went 1:02.55 to win the men’s 100 breast in a FINA B cut. And fellow Bahamian Joanna Evans continued her huge weekend with a 4:14.11 to win the 400 free – also under the B cut, though off her season-best.